Just give us your name, address, phone number and what you need (wood, chips, hardwood only, etc.). We’ll add you to our list. The next time we’re close to you and are looking for a place to unload, we’ll give you a call and swing by to deliver. We service all of Augusta County, so chances are good that we’ll be in your neck of the woods at some point. Lots of people in the Valley have wood stoves or even outdoor wood-burning furnaces. Why not get some of your wood for free, delivered right to your location? When you contact us, make sure you let us know what kind of wood you need. Those with outdoor furnaces can often burn any type of wood, including pine and other conifers. If you have an indoor wood stove, you may need to specify hardwoods only. Please note that our wood is uncut and unsplit. Wood chips, or wood chip mulch, can be highly beneficial for your garden beds. If left in a pile for awhile, they will begin to decompose, providing nutrient-rich compost that your soil will love. You can also use them like mulch and spread them on your beds accordingly. Our chips come straight from the trees and branches we remove, so there are no chemicals or preservatives, making them a good choice for mulch in beds with edible plants. This kind of mulch/compost is an environmentally friendly, sustainable option which benefits both the tree service and the customer. For more information on wood chip mulch or compost, check out the film Back to Eden. Gardener Paul Gautschi explains the many benefits and incredible results of using wood chips the right way. To be added to our list of delivery locations, please fill out the form and we’ll be happy to swing by next time we’re close to you! 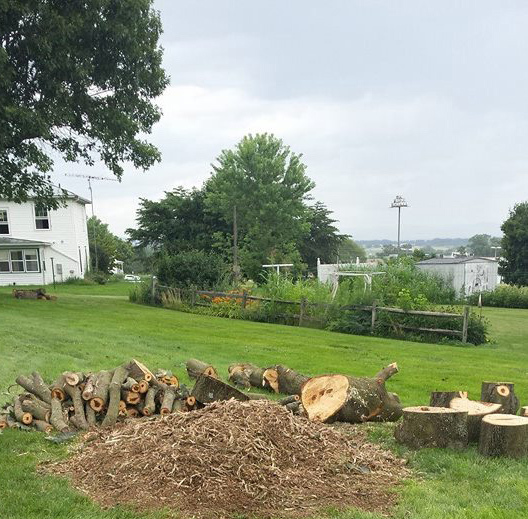 Get Your Firewood and Mulch Delivered in Staunton and Beyond! Don’t think of firewood or mulch as something extra to have around, think about it as something necessary and from nature that will help you out in all seasons. Call us today to schedule a delivery, talk about prices, or find out more.